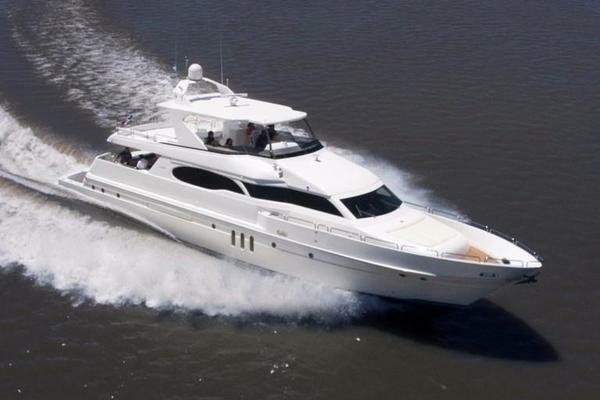 United Yacht Sales New Jersey would love to guide you through a personal showing of this 72' Hatteras 72 Motor Yacht 2008. 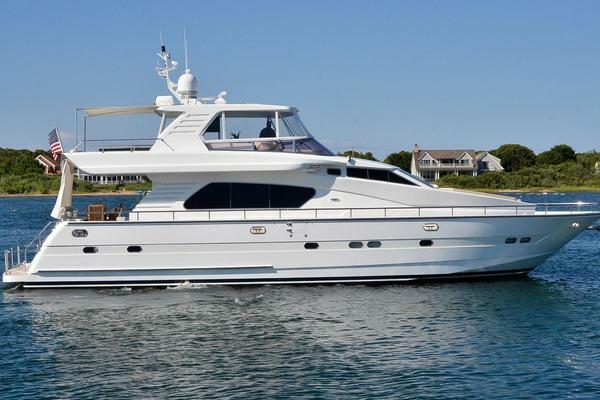 This yacht for sale is located in Boston, Massachusetts and priced at $1,999,000. For a showing please contact us by filling out the form on this page and we will get back to you shortly! INSTALL 3" WIDE BEVELED PLANKS IN STAIRWELL GOING FORWARD FROM OPTIONAL PILOTHOUSE TO SLEEPING QUARTERS FORWARD. DO NOT INSTALL TOUCH LATCHES ON DOORS. INSTALL PUSH/PULL STYLE LATCHES. FURNISH AND INSTALL EXTRA LIGHTING OVERHEAD AND INCORPORATE DUAL FLOOD FIXTURES (CANTILUPI) FARO-Q (4 EACH) IN STRATEGIC LOCATIONS IN SALON. SEE REVISED ELECTRICAL PLAN. INCORPOATE SHALLOW STORAGE CAIBNET INSET INTO PORT FORWARD SALON STUDWALL. FURNISH AND INSTALL CUSTOM OVERHEAD CEILING TREATMENT IN SALON OVER THE DINING TABLE. AREA TO BE ROUND (APPROXIMATELY 60 INCHES) AND RECESSED (APPROXIMATELY 4 INCHES OR AS DEEP AS POSSIBLE) WITH TRIPLE BULLNOSE MOLDING SIMILAR TO THE 80MY. MOLDING TO HAVE ROPE LIGHTING BEHIND IT. CENTER OF RECESSED SPACE TO HAVE SECTIONS OF CLEAR PLEXIGLASS MIRROR WITH A CHANDELIER MOUNTED IN CENTER. REPLACE STANDARD CROWN MOLDING IN THE SALON PORT AND STARBOARD AND ON THE MASTER STATEROOM AIR CONDITIONING SOFFITT OVER THE BERTH TO A TRIPLE BULLNOSE DESIGN SIMILAR TO THE 80MY MOLDING. FURNISH AND INSTALL A SMALL RECESSED CABINET IN THE FORE AND AFT BULKHEAD ABOVE THE AIR CONDITIONING CABINET TO STARBOARD AND AFT IN THE SALON WITH A SINGLE DOOR AND 2 ADJUSTABLE SHELVES INSIDE. MAXIMIZE DEPRTH OF CABINET ALL POSSIBLE WITHOUT INTERFERRING WITH AIR CONDITIONING DUCT OUTBOARD. REQUESTED DIMENSIONS ARE 14 INCHES WIDE, 30 INCHES TALL AND 10 INCHES DEEP. INSTALL A SINGLE DUPLEX 120 VAC OUTLET INSIDE OF THE CABINET. MODIFY CONSTRUCTION OF CABINETS OUTBOARD OF SALON BAR IN STUD WALL TO MINIMIZE WIDTH OF AND ADD TO NUMBER OF DOORS AND CREATE MORE OPEN SPACE FOR ACCESS BEHIND BAR WITH DOORS OPEN. REMOVE PORT SIDE TIDE-RIDE SEA STAIR STORAGE RECESS IN SUPERSTRUCTURE SIDE AND HEAL OVER OPENING. CONSTRUCT CABINETS ON THE INTERIOR OF THE SALON IN THIS AREA AS A CONTINUATION OF THE AFT PORT SIDE SALON CABINETS. SEA STAIRS TO STORE IN REMAINING RECESS ON STARBOARD SIDE. INCREASE THE WIDTH OF THE TOP OF THE STARBOARD SIDE AFT AIR CONDITIONING END TABLE CABINET IN THE SALON BY APPROXIMATELY 6 INCHES AND FORM OPEN SLIDE IN MAGAZINE-BOOK STORAGE ACCESSIBLE FROM INBOARD SIDE OF CABINET. INSTALL FALSE BACK IN RACK TO PREVENT BOOKS OR MAGAZINES FROM GETTING LOST IN BACK OF OPENING. THE END TABLE AIR CONDITIONING CABINET STARBOARD AFT IN THE SALON IS TO HAVE A WOOD TOP WITH STANDARD MOLDING. DINING TABLE -- (A.J. ORGINALS) 54" ROUND; SELF STORED LEAF IN PEDESTAL OPENING ONE WAY TOWARD CENTER OF BOAT ONLY; MAHOGANY STRAIGHT GRAIN PERIMETER WITH 1/4" BLACK INLAY WITH CROTCHED MAHOGANY STARBURST MITERED WITH GRAIN, GRAIN DIRECTION TO THE CENTER. PEDESTAL TO BE STRAIGHT GRAIN MAHOGANY. SUNKEN BAR IN SALON TO CHANGE TOP SHAPE AND BUILD SHORTER PER DRAWING. INSTALL 9" GEMINI STAINLESS STEEL BAR SINK AND STANDARD FAUCET. INSTALL 15" WIDE WINE COOLER IN LIEU OF STANDARD ICEMAKER. GLASS AND BOTTLE STORAGE BELOW BAR. UPPER BAR TOP HEIGHT TO BE RAISED SO THAT THERE IS JUST ENOUGH SPACE FOR RECEPTACLES AND A SWITCH INSTALLED HORIZONTALLY ON THE FACE BETWEEN THE LOWER AND UPPER BAR SURFACES. RELOCATE STANDARD BAR RECEPTACLE FROM BULKHEAD AFT OF BAR TO FACE BETWEEN BAR TOPS AND INSTALLED (2) ADDITIONAL RECEPTACLES SPACED EVENLY, ONE AFT, ONE FORWARD AND ONE IN THE MIDDLE. THE BAR LIGHT SWITCH ADJACENT TO THE MOST FORWARD RECEPTACLE. CONSTRUCT A SHALLOW UTENSIL DRAWER INCORPORATED IN BAR. HOLDING TANK GAUGE PROVIDED SHOWING AVAILABLE CAPACITY FOR HOLDING TANK ONLY. (HEADHUNTER) LED STYLE UNIT INSTALLED WITH DISPLAY LOCATED IN STAIRWELL AFT OF SALON BAR, INBOARD SIDE AT APPROXIMATE EYE LEVEL. ALSO A HOLDING TANK PUMP OUT SWITCH AT THIS LOCATION. DAY HEAD FLOORING INSTALLED BY (AMERICAN TILE) MW05326-C TIGRIS MESH 011-52. DAY HEAD COUNTERTOP (AMERICAN TILE) NERO PORTORRO WITH BULLNOSE EDGE. DAY HEAD SINK (HERBEAU FROM DORNBRACHT) 4301 SEINE OVAL BOW IN FINISH 65, HAMMERED POLISHED NICKEL; UNDERMOUNT. GALLEY ISLAND AND A 27" WIDE SUB ZERO DRAWER STYLE REFRIGERATOR IN THE AFT SECTION OPENING TO PORT AND A ROLL OUT TRASH BIN FORWARD. ROLL OUT FOR TRASH BIN TO ACCOMODATE AS LARGE A GARBAGE CAN AS POSSIBLE. A SMALL DRAWER ABOVE THE TRASH BIN SLIDE OUT. CONSTRUCT A MAGAZINE RACK ON THE FRONT OF THE ISLAND CABINET. FURNISH AND INSTALL A DOUBLE DRAWER KITCHENAID DISHWASHER FORWARD OF THE SINK IN THE GALLEY, MODEL KUDD01DPPA . FLORESCENT LIGHTING UNDER CABINETS TO PROVIDE SUFFICIENT WORK SURFACE LIGHT IN GALLEY. LED UNDER CABINETS TO BE INTERSPERSED TO PROVIDE SEPARATELY SWITCHED "MOOD" LIGHTING. INSTALL WOOD TRIM AROUND FLOURSCENTS TO HIDE FIXTURE. ORDER AND INSTALL A 12" FIXTURE FOR FORWARD GALLEY CABINET. OMIT STANDARD DINETTE FORWARD OF GALLEY AREA. CUSTOM ARRANGEMENT TO INCLUDE TABLE MOUNTED ON PEDESTAL WITH DINETTE SEATING FORWARD AND SPACE FOR LOOSE CHAIRS AFT. CONSTRUCT STORAGE ON BOTH PORT AND STARBOARD SIDES OF TABLE AREA. PORT SIDE STORAGE TO HAVE LARGE DRAWERS WITH SIDE CUT OUTS FOR POTS AND PANS AND OTHER LARGE ITEMS. SEE CUSTOM DRAWING. OMIT STANDARD COOKTOP AND MICROWAVE. INSTALL A (SHARP) INSIGHT COMBINATION RANGE WITH COOKTOP, MICROWAVE DRAWER AND OVEN, MODEL KB 4425 LS (STAINLESS STEEL). INSTALL A (SHARP) SPACE SAVING HOOD ARRANGEMENT OVER THE COOKTOP, MODEL KB 0333 KS (STAINLESS STEEL). INSTALL A SMALL CABINET OVER THE HOOD. MAXIMIZE THE STORAGE IN THE PORT AFT CORNER OF THE GALLEY BASE CABINET TO TAKE ADVANTAGE OF ANY AVAILABLE SPACE NOT BEING TAKEN UP BY THE PORT FORWARD SALON AIR CONDITIONING UNIT. DELETE SLIDE OUT SPICE DRAWER AND INCORPORATE A LAZY SUSAN IN THE REMIANING SPACE COMBINED WITH SPACE FORWARD OF AIR HANDLER. FABRICATE AND INSTALL A CEILING CABINET OVER THE GALLEY ISLAND. CABINET TO DROP DOWN FROM HEADLINER APPROXIMATELY 20 INCHES AND HAVE 18 INCH DOORS ON BOTH PORT AND STARBOARD SIDES. CABINET TO HAVE DOWN LIGHTS ON BOTTOM AND 120 VAC RECEPTACLE. DIMENSIONS TO BE 4 INCHES LESS THAN ISLAND CABINET ALL AROUND. NOTE ISLAND BASE CABINET IS CUSTOM SIZED. MODIFY OVERHEAD AIR CONDITIONING RETURN AIR TO A RECTANGULAR OPENING ADJACENT TO CABINET IN LIEU OF STANDARD OPENING. CABINET WILL BE USED FOR CHINA STORAGE. ALSO INCLUDE AN UNDER COUNTER FLUORESCENT LIGHT FIXTURE ON BOTTOM OF CABINET WITH WOOD TRIM AROUND TO HIDE FIXTURE. OMIT SLIDE OUT SPICE RACK ADJACENT TO RANGE AND REPLACE WITH A BANK OF NARROW DEEP DRAWERS WITH FULL EXTENSION SLIDES. MODIFY OPENING IN FORWARD DINETTE AREA TO MAXIMIZE THE OPENING FOR ACCESS INTO THE MACHINERY-ELECTRICAL SPACE UNDER THE WINDSHIELDS. MODIFY STARBOARD FORWARD HALF OF DRESSER IN STATEROOM TO FORM A HINGE LID OVER A DESK AREA AND CONSRUCT FILE STORAGE BELOW. INSTALL A 120 VAC OUTLET INSIDE OF DESK AREA. MASTER STATEROOM BED TO BE NORMAL KING NOT TAPERED SO THAT A STANDARD KING MATTRESS WILL FIT. ADJUST NIGHTSTANDS ACCORDINGLY. STANDARD KING DIMENSIONS ARE 76" WIDE X 80" LONG. ADJUST PLATFORM ACCORDINGLY FOR SPACE FOR COVERS, ETC. MASTER HEAD DOORS (2) FACING STATEROOM ONLY TO HAVE SKETCHED FACE OF STRAIGHT GRAIN MAHOGANY AROUND PERIMETER WITH 1/4" INLAY OF BLACK WITH "X" MITERED BOOKMATCHED CENTER IN MAPPA BURL. ALSO INCLUDED ARE THE OFFICE ENTRY POCKET DOOR, THE MASTER ENTRY POCKET DOOR AND THE STARBOARD STATEROOM ENTRY DOOR. THE OFFICE AND STARBOARD ENTRY DOORS ARE TO HAVE THE SIDE FACING INTO THE COMPANIONWAY IN SKETCH FACE AND THE MASTER ENTRY DOOR SIDE FACING INTO THE OFFICE IS TO BE SKETCH FACE. ALL THE SAME WITH MAHOGANY AND MAPPA BURL. CONSTRUCT RADIUS CORNERS OVER NIGHTSTANDS IN MASTER STATEROOM WITH FINISHED WOOD VERSUS LUAN AND CONTINUE FINISHED WOOD ACROSS ENTIRE BULKHEAD, HULLSIDE TO HULLSIDE. INSTALL (3) BODY WASH SHOWER HEADS IN ADDITION TO STANDARD IN MASTER SHOWER. CONVERT MASTER SHOWER PLUMBLING DIRECTLY TO TRUNK LINES WITH VALVES INSTEAD OF MONO BLOCK. BODY WASH HEADS TO HAVE INDIVIDUAL CONTROL. SEE ALSO ITEMS 170 AND 259. MASTER HEAD FLOORING TO BE -- OPTION 1 - TO BE (AMERICAN TILE) INSTALLATION OF (RENAISSANCE TILE AND BATH) BASKETWEAVE RENNADMOS WOVEN PW/MB IN 12 X 12 IN STATUARY WITH ACCENT KEYS OF BLACK. MASTER HIS AND HER HEAD COUNTERTOPS TO BE (AMERICAN TILE) EGEO ONDULATO WITH BULLNOSE EDGE. IN ADDITION TO SHELF KEEPERS ON THE SHELVES IN THE OFFICE, ALSO PROVIDE REMOVABLE SEA RAILS THAT ARE ADJUSTABLE WITH SHELVES. RAILS TO BE THIN STRIPS OF WOOD WITH SLOTS CUT SO THEY CAN BE INSERTED AND REMOVED AS SHELVES ARE ADJUSTED. PORT GUEST HEAD COUNTERTOP TO BE (AMERICAN TILE) ROYAL ONYX WITH BULLNOSE EDGE. PORT GUEST HEAD FLOORING TO BE (AMERICAN TILE) HONEY ONYX MOSAIC WITH 2" KEYS OF COUNTERTOP (AMERICAN TILE) ROYAL ONYX. AMERICAN TILE TO CUT OUT (4) OF THE MOSAICS TO ALLOW FOR 2" KEYS. MODIFY LOWER BERTH IN OPTIONAL STARBOARD SIDE BUNK ROOM AND INSTALL A LARGE DRAWER ON HEAVY DUTY FULL EXTENSION SLIDES IN LIEU OF A LIFT UP ACCESS TO STORAGE. INSTALL A SMALL SHELF ADJACENT TO EACH BUNK IN THE STARBOARD OPTIONAL FOURTH STATEROOM FOR PERSONAL ITEMS. FURNISH AND INSTALL A (MARVEL) MODEL 60BAR-SS-F STAINLESS STEEL REFRIGERATOR TO STARBOARD ON THE FLYING BRIDGE IN A SIMPLE FIBERGLASS CABINET WITH A STONE TOP. SEE CUSTOM ITEM 212 FOR TOP SPECIFICATIONS. UNIT TO FACE INBOARD. UNIT IS APPROVED FOR OUTDOOR INSTALLATIONS AND THERE WILL BE NO DOOR OVER THE FRONT OF THE UNIT. CONSTRUCT FIBERGLASS CABINET ACCORDINGLY. UNIT TO HAVE HINGE ON THE LEFT SIDE (FORWARD). FURNISH AND INSTALL A CHART STORAGE BOX, SURFACE MOUNTED, TO PORT OF THE FLYING BRIDGE HELM APPROXIMATELY 2" DEEP WITH DOUBLE PLEXIGLASS LIDS WITH A 1/2" SPACER BETWEEN FOR A CHART BOOK. INSTALL A PNEUMATIC SPRING ON THE BOTTOM LID. FURNISH AND INSTALL AN APPROXIMATE 6 FOOT SECTION OF LOUNGE SEATING AFT OF THE FLYING BRIDGE ON THE BOAT DECK WITH HALF-ROUND END TABLES ON EACH END, SAME AS 72MY203. SOLID SURFACE MATERIAL ON END TABLES TO BE (AVONITE) CAIRO F1-9130 SATIN WITH BULLNOSE EDGE. PROVIDE DRAWING TO OWNER FOR APPROVAL WITH PRICE SHOWING LOUNGE INSTALLED AND OWNERS RENDOVA TENDER INSTALLED ON BOAT DECK. LOUNGE TO BE ASSEMBLED AND INSTALLED BY C AND R YACHT SERVICES. END TABLES TO BE FABRICATED AND INSTALLED BY HATTERAS. FURNISH AND INSTALL A DORM SIZED REFRIGERATOR IN THE AREA OUTBOARD OF THE STAIRS FROM THE SALON TO THE AFT VIP STATEROOM. SEE SHAWN. SPECIFICATIONS FOR UNIT TO BE (HAIER) 1.8 CU FT. NO FROST ALL REFRIGERATOR- WHITE. FURNISH AND INSTALL A SHELF OVER THE WATER HEATER TO PORT IN THE ENGINE ROOM FOR OWNER FURNISHED TOOL BOX. CONSTRUCT SHELF AS WIDE AND AS DEEP AS POSSIBLE. ALSO INCLUDE A 6" WIDE FOLD UP SHELF ON THE INBOARD EDGE OF THE SHELF. SEE DRAWING NMD 2285. FURNISH AND INSTALL A FRESH OIL TANK IN THE ENGINE ROOM PLUMBED TO THE OIL CHANGE SYSTEM. PROVIDE DRAWING FOR CUSTOMERS REVIEW. TANK SHOULD HAVE A DOCKSIDE FILL AS WELL AS THE CAPACITY TO BE FILLED VIA A QUICK DISCONNECT AT THE TRANSOM. FILL TANK WITH 55 GALLONS OF CF-4 15W-40 CAT OIL. FURNISH AND INSTALL A DC FRESH WATER BACK UP PUMP IN ENGINE ROOM. REMOVE AC PUMP AND REPLACE WITH DC. GREGORY POOLE POWER SYSTEMS TO FURNISH MANUAL GAUGES FOR ENGINES IN ENGINE ROOM. FURNISH AND INSTALL (2) EACH UNDERWATER LIGHTS BY (UNDERWATER LIGHTS, LTD) IN TRANSOM. BUSTLE HOOP RAILS INCREASED IN HEIGHT BY 5 INCHES. SIDE DECK HOOP RAILS MAINTAINED AT 36 INCHES FROM DECK. RAILS AT STAIRS FROM AFT DECK TO SWIMPLATFORM RAISED 3 INCHES. RAILS ON FLYING BRIDGE RAISED TO 36 INCHES. RAIL ON STAIRS FROM AFT DECK TO BOAT DECK INCREASED IN HEIGHT BY 3 INCHES. BOTTOM (SEA HAWK) CUKOTE, BLACK 3445 GL. Personal artwork and tools in toolbox.